BATMAN #52 – To anyone who dropped BATMAN after issue 50, you are really missing out. Issue 51 features Bruce Wayne on jury duty. I know that sounds like it could be dull, but it was just an incredible comic dealing with the ramifications of everything that went down in issue 50. I am sorry if you are disappointed the story didn’t go exactly how you wanted, but don’t spite yourself by missing this excellent ongoing story. IMMORTAL HULK #4 – Al Ewing has been brilliant on this series. Reframing the Hulk in more of a horror comic setting has been an inspired choice. This is just one of my favorite comics! ADVENTURES OF SUPER SONS #1 – So glad this book didn’t remain “cancelled” for all that long. I love the combination of Damian Wayne and Jonathan Kent. A lot of people were worried that DC was going to get rid of Jonathan, but it seems he will be around for the long haul, and that is a very good thing. 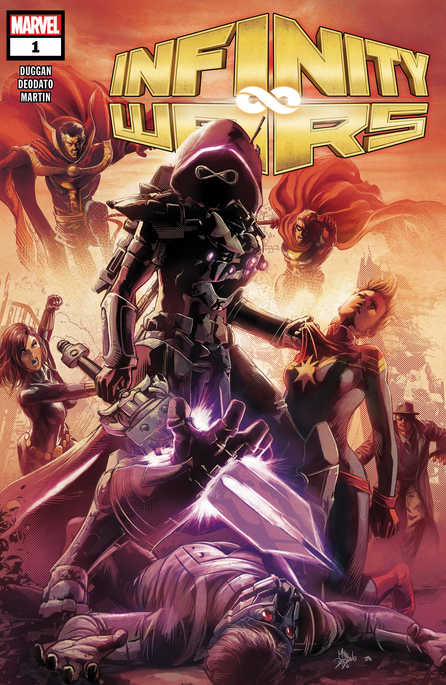 INFINITY WARS #1 – I mentioned last week that my biggest problem with INFINITY COUNTDOWN is that it just seemed uncertain what it wanted to be. I grew up on Thanos and the Infinity Gems, so I am picking this book out of curiosity, but so far it’s just been an okay event that hasn’t really won me over. CAPTAIN AMERICA #2 – To be honest, I found Ta-Nehisi Coates’ work on BLACK PANTHER extremely boring, so I had considered just skipping his run on CAPTAIN AMERICA. But I had been reading CAP pretty consistently since Brubaker’s run, so I figured I would give the first issue a try. I was very pleasantly surprised. This is some great CAPTAIN AMERICA here!